I hear it all the time: “It’s really hard to exaggerate what’s going on around here.” Monstrous industrial buildings are going up almost overnight. Entire trainyards, replete with thousands of freshly-minted tankers, are embossed to the countryside in days. Networks of pipelines are planted six feet under as if by moles. Natives have been rolling (or reeling) with the changes for several years. Newcomers become initiated quickly; a period then followed by an effort to sink stakes into a continually shifting landscape. Such is “The Bakken,” where four billion barrels of recoverable crude are known, and several times that number are predicted. There is a softly-spoken undertone to the daily dialog: “We ain’t seen nuthin’ yet, and we ain’t necessarily lookin’ forward to what’s comin’. So human nature kicks in and we inoculate ourselves against future shock. We hang on to those things which have made life comfortable all along; we try to find new ways to improve our lot. Then something comes along — something so unusual, so remarkable — that it actually merits our gaze; needs to be shared and talked about. I came upon these items just in the past week. 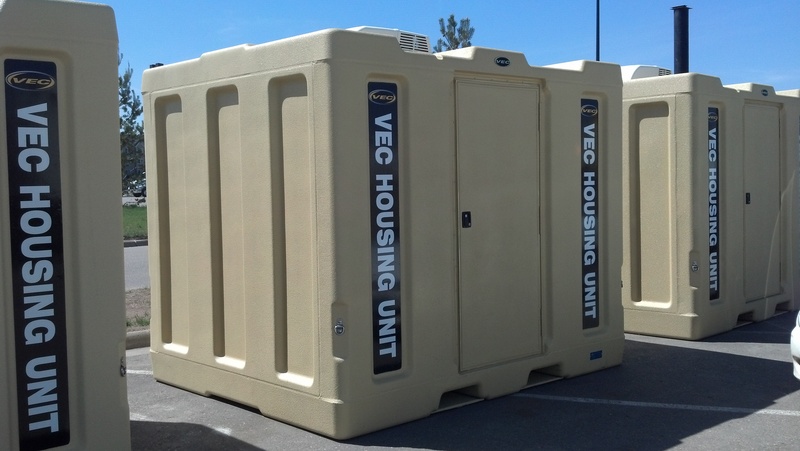 For $25,000 (plus options), you can buy a VEC Housing Unit. 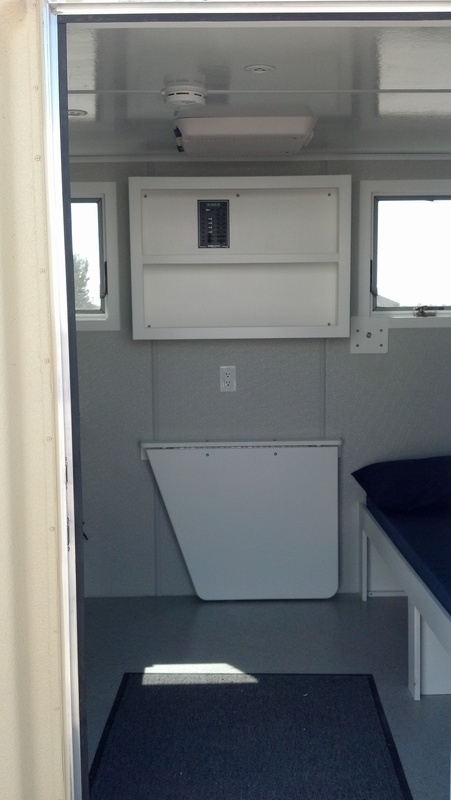 “The Cube” is about eight-feet square inside with a seven-foot ceiling, has a fold down table, mini-fridge, countertop, microwave, lockable dresser, closet, and a 32″ flat panel TV. 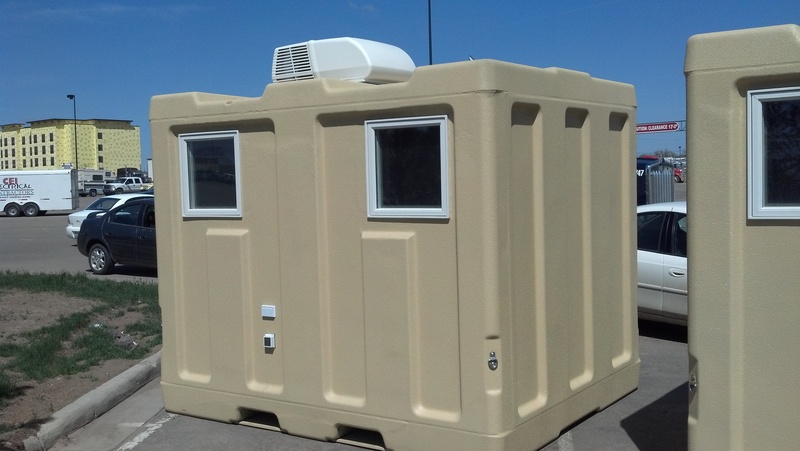 A toilet and/or sink can be added as options, but they’ll take away from the aforementioned space occupiers, and you can forget about adding a shower. This is a living space for (not one, but) two people who sleep on the skinniest of bunks. The Cube is insulated to 30°F below zero, and has an air conditioner on its roof to hum you through those hot summer nights. Williston’s Walmart is the exclusive purveyor of these humble abodes. Hurry and buy yours now. Four of them are on display in the parking lot. Bring your own forklift. The headline read: “Buffalo Wild Wings Not Coming To Williston.” That’s news? Something’s not going to happen? As it turns out, the Twin Cities-based restaurant chain was examining the possibility of entering this market. So they placed a classified ad in the local paper which offered $12-15/hr to prospective part-time staffers. No one responded. That was an inexpensive way for the company to learn that there isn’t a sufficient pool of workers for such things as cooking, serving, and busing tables. If you’re qualified, you’re making twice that in a man camp dining hall. Of course, there won’t be a lovely dining experience awaiting when you get off work. Since we’re on the subject of food…lunch trucks are rolling in from all corners of the country. Local city and county governments are trying to get them licensed for tax purposes and inspected for health conformity. 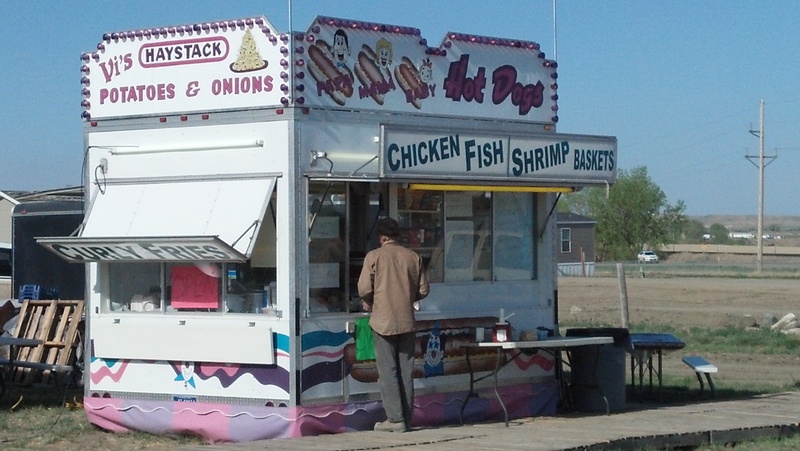 One small town has just relegated all of its food trucks to the fairgrounds and is meting out stiff daily rental fees for the privilege. This, of course, raises prices. Oilfield workers are happy to pay the premium; happier still for the variety of available cuisines. If there’s one thing we don’t have here, it’s variety. Or quantity. I guess that’s two things. One thing we don’t have for sure is an amusement park atmosphere, so someone got the bright idea to bring it here. This food vendor magically appeared one day last week. It’s parked right next to a man camp, of course, and there’s always a customer or two queued up in front. Color! That’s what we need more of. Cover the monotonous greens and earth-tones with carnival colors. That’ll pick up the mood. But when the day is done, you have to go home to your man camp or cube. Maybe you were smart and brought your own RV. Sorry about the lot rental fees. Back in civilization, that kind of loot would make the mortgage payment on a nice house. But maybe you’re making enough money to cover that and still have some left over. 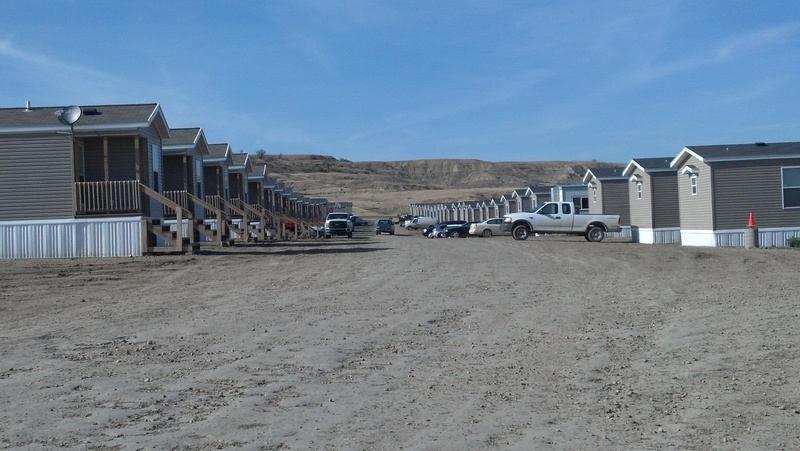 Well then, you are a candidate for this: an enclosed RV park. 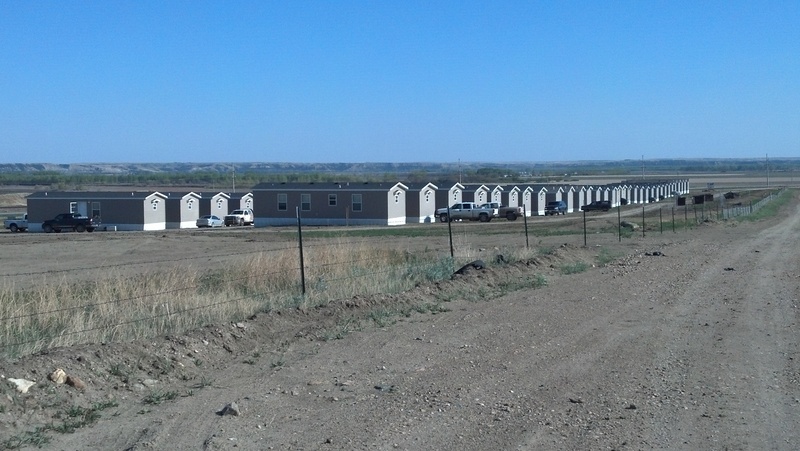 Yes, a Minnesota developer who smells money sees opportunity has identified a need has just received a permit to build ten structures with enough space to contain 240 RV’s. It’ll include all hookups and laundry facilities. Sign up today! Lots are going fast. So is your hard-earned cash.